I make: Breakfast pizza edition (2) | Random moosages as I see fit. So…yes, this post does warrant a pizza tear because I will tell you a very sad story involving a pizza. Not really. I mean, it is kind of sad. But it was more irritating than anything. Anyway, I’ve been making more breakfast pizza. And I think I’ve decided on the crust and toppings that I like the best. I like using the yogurt crust when making breakfast pizza. Using the yogurt crust means you don’t have to plan ahead for breakfast pizza. Yogurt crust comes together quickly and you can use it right away. Also, yogurt crust is a bit dryer than the no knead crusts (three links) and it’s easier to roll out so that it’s quite thin. I’ve decided I like a light, crisp crust for a breakfast pizza instead of a heartier one with a lot of chew. As for toppings, I like tossing some asparagus, grape tomatoes, garlic, and some shredded/grated parm and/or asiago in some olive oil. Then using that olive oil to spread onto the crust after rolling it out (you can roll it out to at least a 12″ diameter). Then dumping all the toppings on and arranging everything so that you have some fenced in areas for some eggs to be cracked on top. 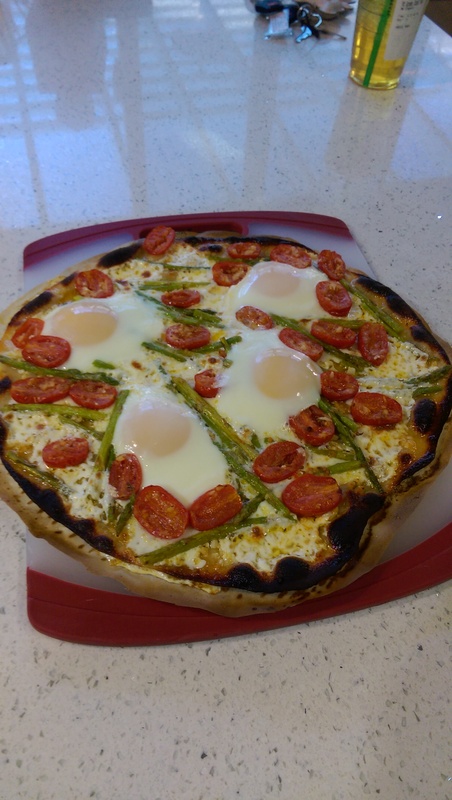 Before cracking the eggs on top, I like to slide the pizza with all the toppings (minus eggs) onto a preheated pizza stone in the middle of the oven at 550degF for 5-7 minutes. Then I pull the rack out and crack the (room temp) eggs into the topping fence and slide the rack back in under the broiler on high for another 5 minutes. The result is a crisp crust with perfectly runny yolks. The asparagus is tender by that point, the tomatoes are starting to shrivel a little and have sweetened up, and the garlic is really fragrant. Seriously guys. It’s delicious. Now, onto the sad part of the story. The last time I made one of these pizzas, I ended up rolling out the dough thinner than I usually do. I just wasn’t paying attention. This isn’t really a problem except for the fact that my pizza peels are no larger than 12″ in diameter and I rolled the dough out to at least 14″. That’s possibly a 2″ overhang on almost all sides where toppings can go sliding off. Also, my pizza stone is 14″ in diameter. 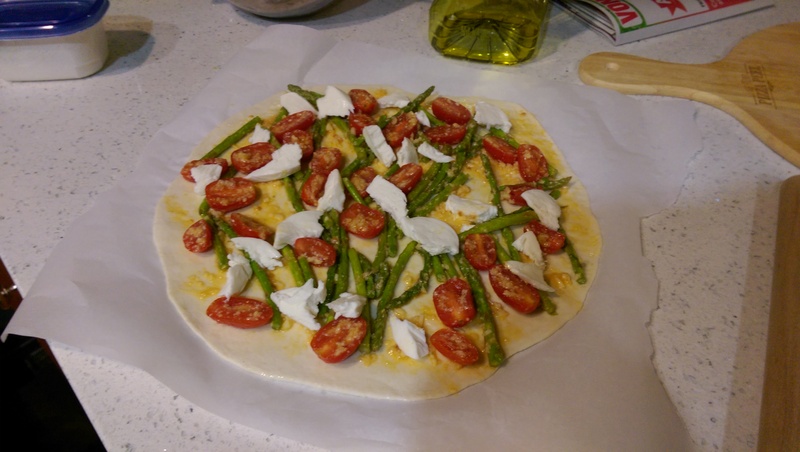 I did have the pizza resting on parchment paper, so the edges weren’t just completely flopping over the sides of the peel, but I did end up losing some asparagus and tomatoes near one of the edges. Horse was appreciative. Losing a few toppings wasn’t a big deal either really…except that it slightly compromised one of my topping fences. This wasn’t apparent until after I had pulled the pizza out to add the egg for the broiling part of making a breakfast pizza. Three of the eggs stayed on the pizza just fine. One of the eggs did not. But! 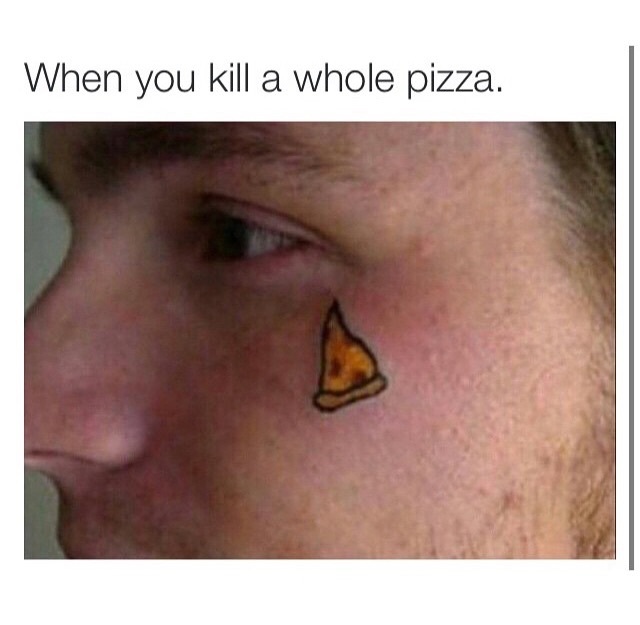 It looked like it would stay on the pizza. It was actually the first one I cracked on. It slid a little bit but then settled and I thought everything would be ok. But as I was cracking the other eggs on top of the pizza, the first one started to slide a little. It made me a little nervous, but then it stabilized again. A-pusher, who was over to carpool with me to clic and partake in breakfast pizza, and I both breathed a sigh of relief. It would be ok.
oven door where it started to sizzle merrily away. Also, I might add that this occurred on a Monday. Monday and I already have a very strained relationship. This did not help at all. This was from a successful batch, except that I cracked one of the eggs too far into the pizza.